Microsoft is hoping the third time will be the charm for its attempt to break into the tablet market. 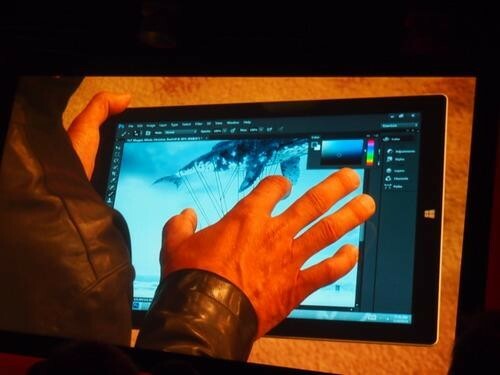 At a press event in New York on Tuesday, Microsoft introduced the Surface Pro 3, the third in its line of tablets that aim to serve as a device for both entertainment and for your work. The company proclaimed that the Surface Pro 3 is “the tablet that can replace your laptop,” a clear dig at Apple’s iPad, and perhaps, too, the general impression that tablets can’t do the job of a laptop computer for daily work. The Surface Pro 3 runs a full version of Windows 8, meaning that owners can run desktop Windows apps like the Microsoft Office suite, as well as apps made for tablets. Buyers can also purchase an attachable keyboard and mouse to transform the Surface into a more traditional laptop. 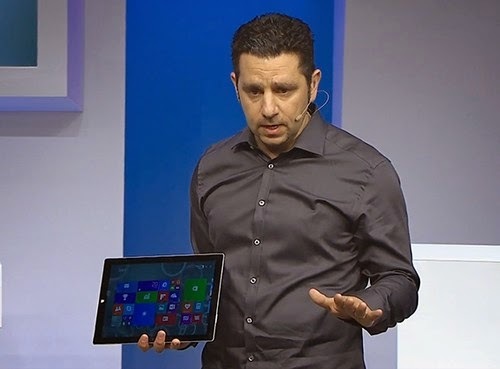 Microsoft exec Panos Panay said the Surface Pro 3 was faster, thinner, and lighter than the Surface Pro 2. 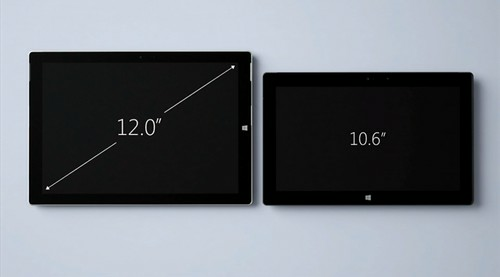 The screen is also larger, increasing in size from 10.6 inches to the more laptop-like 12 inches. The Surface Pro 3’s built-in kickstand is also far more flexible, working with a movable hinge that makes it possible to view the screen from almost any angle and to use the Surface on one’s lap. 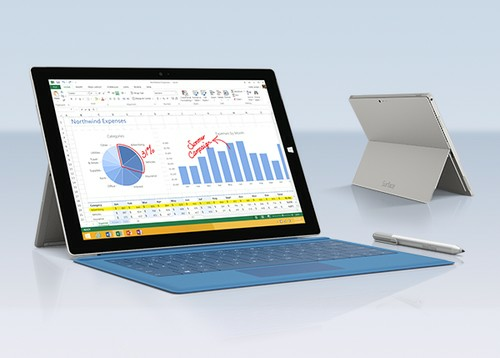 The Surface Pro 3 marks Microsoft’s latest attempt to crack into the expanding tablet market. Microsoft introduced its first two Surface tablets, the Surface RT and Surface Pro, in a surprise media event, announced just a day before it occurred, in June 2012. The Surface, which represented Microsoft’s first try at making hardware that could run its software, was viewed as an attempt to boost interest in Microsoft’s new Windows 8 operating system, which was a total redesign of the familiar Start menu-based Windows and which was built to be touch-friendly. The tablets were initially received well, with curious online commenters praising the design, the built-in metal kickstand, and the ability to view two apps on the screen at once. 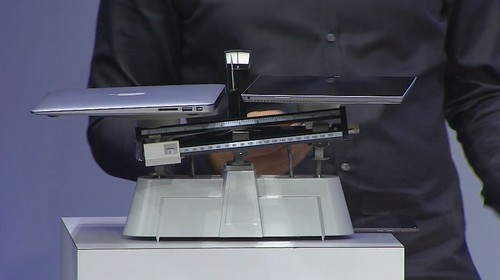 Microsoft’s Panos Panay shows the light weight of the Surface Pro 3 as compared to a 13” MacBook Air. (Microsoft)But by the time the Surface went on sale months later, the enthusiasm had waned, and Microsoft failed to capture much of a foothold in the tablet market. Currently, that market is dominated by Apple’s iPad and various devices running Google’s Android operating system, including Amazon’s Kindle Fire. According to the research firm IDC, tablets running a version of the Windows 8 operating system made up less than 2 percent of the tablet market in the first part of 2014, a grim mark for Microsoft. 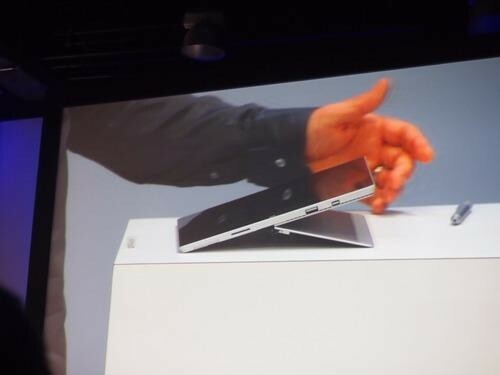 There’s no clear, single reason why the Microsoft Surface hasn’t caught on. Reviewers have variously dinged the Surface for its lack of app selection, its lackluster accessories, and its weight when used in tablet mode. Whatever the reason, it has never really captured the world’s attention, despite a mega-million dollar ad campaign from Microsoft. The Surface Pro 3 will go on sale for pre-order on Wednesday, starting at $799.